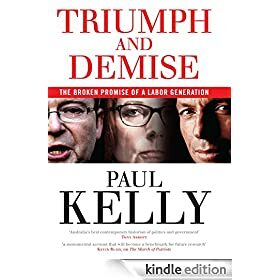 I've finally got a moment to begin reading Paul Kelly's Triumph & Demise. But there's still hope for the likes of more pedestrian authors like myself. I opened it at p102, his (Kelly's) account of the Gillard/Rudd pact to destroy Beazley. Surprisingly, I feel, although he details Rudd's visit to Melbourne to address the Left at Lygon Street (an important step in gaining support from this quarter) he doesn't even mention the meeting between the two leadership aspirants on the NSW North Coast where they sealed their pact. This was the point at which the two actually reached their agreement that Rudd would be the boss. Also, on p105 he says Chris Evans became the "future treasurer and Senate leader". Well, it's not often that we've had a Treasurer in the upper house and I don't actually think Evans did become treasurer. And there are a few other infelicitous sentences. Don't get me wrong. I'm not being picky and nor am I suggesting there are gaps or sloppiness in the work. It's excellent. The point is that everything is the product of a person. Witnessing the fact that Kelly remains a mortal offers hope to those of us who are more pedestrian writers and analysts. We should be thrilled that each of us can aim to achieve Kelly's heights.